Our society keeps growing with a large number of complicated machines and systems, while we are spending our diverse lives. The number of aged people has been increasing in the society. It is more likely than ever that we are involved in dangers, accidents, crimes, and disasters. Securing and supporting our daily life, building reliable infrastructures against large scale disasters, and preventing unexpected human errors are crucial issues in our highly developed complex society. 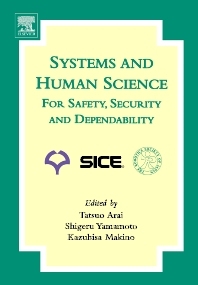 The systems theory can provide "modelling, decision analysis and management for safety and security" as well as "fault detection and reliable control for the design of fail-safe, fool-proof machines and systems". If the human nature is analyzed and treated properly in the process of designing machines and systems, we could create safer, more reliable, and more intelligent machines and systems that can support our society and give us no anxiety and no uneasiness. "Hybrid systems modelling human behaviours" and "services for human" could give proper examples in this respect. "Robotics for safety and security", "safety recovery systems", "visual surveillance and monitoring", and "transportation systems for safety and security", those will provide powerful tools for safe, secure, and reliable systems to achieve peaceful society. Evaluations of systems in the aspects of sense of security and feeling of easiness. Researchers and engineers in the field of Safety Systems and Reliable Systems. Graduate students. Preface. SSR2003 Conference Committees. List of Referees for Paper Selection. Multiple Participant Decision Making in Societal and Technological Systems, (K. W. Hipel, L. Fang). Mathematical Modeling for Coping with Uncertainty and Risk, (M. Makowski). Managing Complex and Dynamic Systems for the Future, (E. D. Jones). Characteristics of Visual Attention and the Safety, (T. Miura, K. Shinohara, T. Kimura, K. Ishimatsu). Agent-based Approach to Complex Systems Modeling, (M. Ryoke, Y. Nakamori). Additional Learning in Computational Intelligence and its Applications to Risk Management Problems, (H. Nakayama, K. Kuramoto, M. Arakawa, K. Furukawa). Integrated Assessment of Global Warming Stabilization Scenarios by the Asia-Pacific Integrated Model, (T. Masui, K. Takahashi, M. Kainuma, Y. Matsuoka). Trust and Acceptance of Risks, (S. Fujii, T. Kikkawa, K. Takemura). Value Judgement for Evaluating Sense of Security of Nursing Care Robots Based on Cumulative Prospect Theory, (H. Tamura, Y. Miura, M. Inuiguchi). A Case Study of Resolving Social Dilemma among Multiple Municipal Governments in Locating a Large-Scale Refuse Incineration Plant, (S. Fujita, H. Tamura). Lifecycle Cost Evaluation of Maintenance Policy -The case of water transmission system in Kobe, (K. Tanimoto, M. Matsushita, H. Tatano). Securing Fair Water Allocation in the Aral Sea Basin, (L. Fang, L.Z. Wang, K.W. Hipel). On Fault Detection Based on Recursive Subspace Identification, (H. Oku). Structure of Reliable Controllers, (N. Sebe, A. Mochimaru). Simultaneous Stabilization and its Application to Reliable System Synthesis within a Behavioral Framework, (O. Kaneko, T. Fujii). Fault-Tolerant Control Using Time-Sharing Multirate Controllers, (H. Kawahara, Y. Ito, N. Babaguchi). Fault Diagnosis for Robust Servo Systems, (K. Suzuki, A. Murakami, K. Matsumoto T. Fujii). Small Reaction Manipulator for GPR Sensing Head Maneuver, (H. Yabushita, Y. Hirata, K. Kosuge). Mine Detection Algorithm Using Pattern Classification Method by Sensor Fusion -Experimental Results by Means of GPR-, (M. Fujimoto, K. Nonami). Land Mine Detection Algorithm Using Ultra-Wide Band GPR, (T. Fukuda, K. Yokoe, Y. Hasegawa, T. Fukui). Development of Highly Sensitive Biosensor for Explosive Substances, (T. Onodera, R. Harada, D. Ravi Shankaran, T. Sakai, J. Liang, Y. Asano, N. Miura, T. Imato, K. Toko). Complex-Valued Self-Organizing Map: A Framework of Adaptive Processing for Multiple-Frequency Millimeter-Wave Interferometric Imaging Systems, (A. Hirose, T. Hara). FDTD Simulation on Array Antenna SAR-GPR for Land Mine Detection, (T. Kobayashi, X. Feng, M. Sato). Modeling of Driver’s Collision Avoidance Behavior based on Expression as Hybrid Dynamical System, (J.H. Kim, S. Hayakawa, T. Suzuki, K. Hayashi, S. Okuma, N. Tsuchida, M. Shimizu, S. Kido). A Case Study in Human Error Modeling Based on a Hybrid Dynamical Systems Approach, (K. Uchida, S. Yamamoto). Development of UMRS (Utility Mobile Robot for Search) and Searching System for Sufferers with Cellphone, (T. Takamori, S. Kobayashi, T. Ohira, M. Takashima, A. Ikeuchi, S. Takashima). Proposal of Wheelchair User Support System Using Humanoid Robots for Creating SSR Society, (K. Sakata, K. Inoue, T. Takubo, T. Arai, Y. Mae). Study of Localization of Mobile Robot based on ID Tag, (W. Lin, S. Jia, K. Takase). Nuclear Safety Ontology -Basis For Sharing Relevant Knowledge among Society, (K. Furuta, T. Ogure, H. Ujita). Excavation of Non-Stockpile Munitions in China, (H. Niho). A Human-safe Control for Collision Avoidance by a Redundant Robot using Visual Information, (J. Huang, I. Todo). Management System for Cameras' Video Data in Emergency, (Y. Wang, Y. Hijikata, S. Nishida). Visual Object Tracking based on Multi-Viewpoint 3-D Gradient Method, (T. Moritani, S. Hiura, K. Sato). Invariant Image Information and Face Detection in Unrestricted Posture, (J. Yamaguchi, H. Seike). Head Detection and Tracking for Monitoring Human Behaviors, (Y. Mae, N. Sasao, Y. Sakaguchi, K. Inoue, T. Arai). Adaptive Background Estimation and Shadow Removal in Indoor Scenes, (J. Morita, Y. Iwai, M. Yachida). Tracking People and Action Recognition from Omnidirectional Images, (A. Matsumura, Y. Iwai, M. Yachida). An Evacuation Problem in Tree Dynamic Networks with Multiple Exits, (S. Mamada, K. Makino, S. Fujishige). A Proposal of both a Concept and a Prototype of a Driver Secure System, (S. Washino).